Sometimes I have to remind myself that I am a reasonably serious old bloke who has scribbled poems for about 50 years. 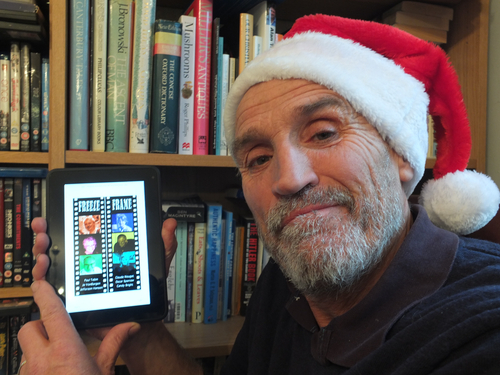 Finding myself posing in a Santa hat holding a Kindle Fire device for a picture to be captioned with punny quips made me wonder if I had lost the plot. If I appear disrespectful to poets and poetry I do apologise. O brave new world that has such peep-shows in it. Such is the circus of the modern book world. Apparently some fiction writers are so busy on the road that all their stuff is done by ghost writers. Seemingly it’s the brand that matters. It seems incredible to me. Perhaps I won’t beat myself up over the Santa hat. If it makes poetry more accessible and unstuffy then it has to be a Google plus. I defy anyone to ghost write in the style of any of the six Freeze Frame writers. Far more importantly, the book is out there and up on Amazon. It was delivered without anaesthetic during the night, about 24 hours premature but at a good weight and with powerful voice. This is not the end of course but at least everything is all together and in one place. The stars are the poets who had enough faith in me to join in and risk all to be part of the Freeze Frame project. Stop the world – FREEZE FRAME – it’s the launch party!